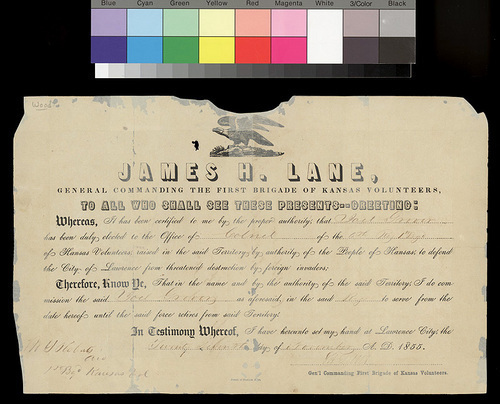 This printed document, headed with the name "James H. Lane," announces the election and certification of Joel Grover as colonel of the 6th Regiment, First Brigade of Kansas Volunteers. The volunteers were raised "to defend the City of Lawrence from threatened destruction by foreign invaders." It is dated November 27, 1855, and signed "J. H. Lane," general commanding.